All can be accomplished with no net increase in government spending and without traversing most contentious partisan tax issues. The 2-4-8 Tax Blend is proof that broad liberal economic objectives can be achieved with very conservative policies. In Part II there is a discussion of tax philosophy, competing tax reform suggestions, spending and details on selected issues. For focus and scope, particular emphasis is placed on responding to the Heritage Foundation's Backgrounder, "A Tax Reform Primer for the 2016 Presidential Candidates", by Curtis S. Dubay and David R. Burton, April 7, 2015. Most tax expenditures are intended for specific investment activities. When tax rates are too high, congress has historically helped some by enacting tax expenditures (credits, deductions, special rates, deferrals and exemptions). Unfortunately, the incentives distort business decisions and cause the economy to perform less efficiently. Regulations may have a similar distorting impact. Sometimes tax expenditures are contradictory by encouraging business investment and another rewarding charity which discourages business investment. Some tax expenditures benefit important industries like electric cars, wind power, private jets or movie making. Others exempt or postpone taxes with questionable public benefit. Other things being equal, lower tax rates with fewer tax expenditures and less regulation are better for free market efficiency. Tax Expenditures amount to 7.5 percent of GDP while other government spending is only 5.2 percent of GDP. When graphically matched against the federal budget (above), it is easy to see the scope of the problem. The evaluation of tax expenditures by the Senate Finance Committee and its Subcommittees would be much easier if businesses would provide a clear consensus that they are willing to forgo tax expenditures for a low income tax rate sweetened by the elimination of payroll taxes. The introduction of a 4 percent VAT (the lowest in the developed world) would permit reduction of the C corporation income tax rate to just 8 percent flat and the elimination of payroll taxes. Pass-through businesses could enjoy the same rates. Low rates make it difficult for any business to argue that preferential tax treatment is needed. Reliance on the payroll tax portion of the income tax base, in addition to the non-payroll portion of the income tax base, has led to high tax rates and many tax credits with unintended consequences. For example, even the earned income tax credit, originally designed to help offset high payroll taxes, has resulted in the gradual expansion of low wage and part time jobs. Payroll taxes are not the only way to fund Social Security and Medicare, as many cosponsors of the Fair Tax Act bill know. Rather than imposing a large national sales tax, business tax reform (as described above) would replace the payroll tax revenue while easing the burden on workers. Bill Gates and economist, Casey B. Mulligan, have spoken about how full employment is encouraged by un-taxing jobs for businesses and increasing worker take-home pay by 7.65%. No payroll taxes for U.S. businesses means less outsourcing and higher salaries to encourage near full employment. More spending as a direct result of the elimination of the worker's tax share, also produces a sustained increase in consumer demand. Actual full employment could be achieved by creating transitional jobs with charities paying a little below typical private business salaries. The jobs would range from basic to professional - whatever the charity required. The program would be paid for primarily by limiting use of the charitable tax deduction to charities that voluntarily agree to expand their services with a portion of the contributions received. There is no fixed or rigid limit on the scope of services that can be provided to the young, old and infirm. The maintenance of parks and public facilities can also be enhanced. The transitional jobs program should expand and contract inversely with the needs of the private economy. Fewer transitional jobs are needed when the economy expands while more are needed in times of recession and contraction. Charitable foundations that pass on funds to service charities would keep track of U.S. job requirements and accumulate funds over several years. Thus more money would be available for transitional jobs during economic downturns. Businesses would benefit by having a workforce with sharp skills at the ready. Workers and their families benefit by having supportive transitional jobs available in times of need. The transitional jobs program should also be combined with training, formal education, transportation, child care and health care in accordance with revised rules for consolidated and flexible programs. Since 1995, the wealthiest 10% of the population increased their share of individual wealth from 67.8% to 74.5%. The next 40% (the middle class) saw their share decline from 28.6% to 24.3% (trending toward the 12% global middle class average). Total individual wealth increased significantly from 2010 going from $56 trillion to over $83 trillion today. Thus the middle class decline in share of wealth is somewhat mitigated by being a modestly smaller share of a much larger pie. The poorer half of the U.S. population (working class) is in crisis going from a 3.6% share of wealth to just 1%. In fact, the poorest 25% actually have negative wealth largely due to student loans, mortgages and credit debt (in that order). The economic hardship has produced negative effects on marriage formation and child rearing. If tax reform can reverse the wealth trends by letting low wealth families keep more of their earnings, it is a formula worth considering. The optional net wealth tax in the 2-4-8 Tax Blend does this by permitting those who choose to pay a net wealth tax of 2 percent to obtain a large income tax reduction - paying an 8 percent rate instead of a 26 percent rate. The top income tax rate of 26 percent is consistent with many reform proposals. It is a bit higher than options which do not include payroll tax replacement but lower than what most popular reform plans are able to achieve. The charitable tax deduction would be retained for the 26 percent rate to fund the transitional jobs program described above. Other tax expenditures would be eliminated and capital gains, gift and estate taxes would be subject to the same 26 percent rate as all other income. The stepped-up basis for appreciated property in estates would be eliminated and subject to capital gains taxation. The taxpayer wealth tax election would exclude $15,000 cash and $500,000 per person in tax free savings. Wealth taxpayers would pay no capital gains, gift or estate taxes. Thus, the wealth tax option would be economically attractive to most taxpayers, including a substantial number of high wealth and high income taxpayers. Many taxpayers would value the ability to change investments tax free as part of their retirement or business plan. Unlike the time wasted in most IRS computations, the practice of maintaining a balance sheet is useful for all taxpayers. The vast majority of individuals will see growth year to year and appreciate the tax code that actually helps to make it possible. Those who don't see growth may find more willing support from a government that can readily use family wealth, rather than just income, as a fair measure of poverty and need. For example, instead of providing child care income tax credits it might be more efficient to provide financial support to the custodial parent or parents as a spending program for children from low wealth families with a wider range of income. Spending programs can be better supervised to make sure that funds are paid only to parents that are providing proper care and coordinated with other government programs. The wealth tax computation also permits the deduction of debts from assets for a 2 percent tax savings that would effectively replace and improve upon the current deductions for mortgage and student loan interest. The government retains a fair share because one person's tax deductable debt is another's taxable asset. If, over the course of a decade, the wealthiest 10% slowly decreased their share of wealth from 75 percent to 70 percent, the wealthy would still gain with a slightly smaller share of a much larger pie. More importantly, this would leave enough share (5 percentage points) to double or triple the family wealth of the poorer half of the population and reverse the decline of the middle class. Should All Income Saved and Invested be Tax Exempt? According to the Heritage Foundation, "The best way for tax reform to achieve [its] goals is ... to establish a consumption base, which is any system that taxes income that is spent, but not income that is saved and invested." There is a genuine concern for double taxation (discussed separately below) and the implicit assumption that ordinary people need some tax incentives to help them save is no doubt true. However, once investment level wealth (i.e. $500,000) has been accumulated, individuals need no further government incentive. A half million dollar retirement fund (or a million dollars for two persons) is sufficient to supplement Social Security and provide a modest middle class lifestyle in retirement. More importantly, the wealth distribution trends show that, taken together, 90 percent of the population could be expected to save only two or three percentage points of total available wealth while 50 percentage points or more is already saved and invested by the wealthiest 10 percent. Tax provisions that apply unlimited incentives to all savings and investment would help the very wealthy by a factor of twenty to one and require much higher tax rates than would otherwise be necessary. Even the proposed $500,000 per person limit would actually help wealthy investors by a factor of at least ten to one because they would achieve tax free advantages earlier in their work life and enjoy them longer. Higher than necessary tax incentives to induce savings can be a flaw in tax reform, but unlimited incentives are a major flaw all too common in the global political competition for wealth (discussed further below). Each of the four consumption taxes outlined by the Heritage Foundation (and discussed further below) provides incentives in the form of financial exemptions where none are needed. Those who have enough wealth to elect to pay a 26 percent income tax rate rather than a 2 percent wealth tax obviously need no government tax help to save or invest. C Corporations can obtain the benefit of a low 8% income tax rate without concern for a wealth tax. The Heritage Foundation correctly notes, "Income that is saved or invested is taxed, and the return on that savings or investment is then taxed again. Moreover, income from investments in corporations is double taxed again - first at the corporate level and then when individuals receive dividends or pay capital gains on corporate stock. By double or treble taxing saving and investment at high rates, the tax code deters families from saving for retirement, education, a rainy day, or for any other purpose they desire." The important factor of "high" rates is often overlooked because past efforts to solve the problem have been limited to special tax exemptions while leaving other individual and business tax rates high. The 2-4-8 Tax Blend solves the problem by lowering the corporate income tax to just 8 percent and allowing shareholders to elect a 2 percent wealth tax and pay an 8 percent tax on dividends (and avoid capital gains entirely). The combined "double taxation" rate of 16 percent is just a fraction of the current 35 percent corporate rate standing alone. Even if a taxpayer who elected to pay a 26 percent income tax rate were to consider the additional 8 percent corporate rate, the combined 34 percent "double taxation" rate is less than current top marginal rates for either individuals or corporations. From an investment standpoint, most taxpayers who elected the 26 percent rate would be investing to increase the value of their assets rather than to produce a lot of taxable income. The Heritage Foundation provides summaries of its view of "consumption taxes" which begin with the Traditional Flat Tax and the New Flat Fax. For businesses, income includes only domestic income. This may have the unintended consequence of encouraging businesses to shift income to a foreign source - (a relatively easy task for global businesses with competent tax attorneys). For individuals, there is a large standard deduction (perhaps the size of the income poverty level) before the significant flat tax rate begins on all non-exempt income. Savings and investment under the Flat taxes are treated like Roth IRAs (Individual Retirement Accounts). Growth from savings accumulates after taxes are paid on earnings and later withdrawals from the account are not taxable. Accumulations during intervening periods, including capital gains and dividends, are not taxed. Financial transactions are disregarded when determining taxable income, so interest income is generally tax exempt. "The New Flat Tax has one rate for labor income, minus the amounts that families and individuals save." The New Flat Tax allows pre-tax savings similar to an IRA and payment of taxes when funds are withdrawn during retirement. Deductions are also permitted for charitable contributions and (optionally) for mortgage interest (taxed to the lender). The payroll taxes "can be rolled into either flat tax" for an estimated flat tax rate of 28 percent. Any suggestion that this is less than what middle class workers currently pay comes from improperly attributing both the business portion of payroll taxes and the individual portion (15.3 percent combined) to the worker. An elimination and replacement of payroll taxes would increase worker take-home pay by only 7.65 percent. Each business would be free to use the other 7.65 percent as it sees fit. The Flat Tax rate of 28 percent is even higher than the optional 26 percent tax rate in the 2-4-8 Tax Blend. Since most taxpayers, given the choice, would choose the 2 percent wealth tax option with 8 percent income tax rate, it is clear that the Flat Rate Tax and the New Flat Rate Tax disproportionately help investors and harm workers. Investors would obtain a windfall by eliminating taxation on financial transactions such a dividends, interest and capital gains. 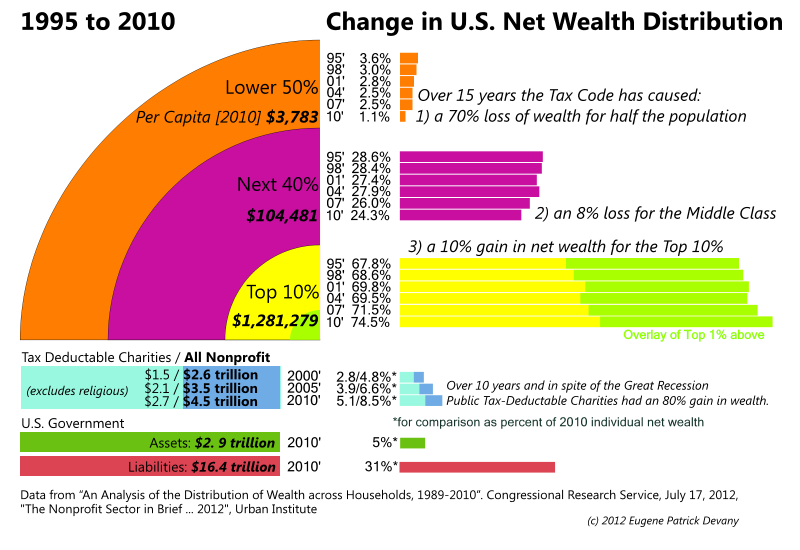 It is worth noting that individual wealth increased by approximately $27 trillion over the last five years. Most of this economic income is from asset appreciation (i.e. increases in stock value, etc.). Most of the appreciation has never been taxed and would avoid taxation under the Flat Rate Tax plans as described. A National Sales Tax, as outlined in the proposed Fair Tax Act, is more easily understood as a consumption tax base with "all consumption goods and services but no intermediate or investment goods or services" subject to tax. The collection of the tax by retail businesses eliminates the need for anyone to file income tax and eliminates major functions of the Internal Revenue Service. The large tax rate of about 30 percent - exclusive, (23 percent - inclusive) and no individual deduction makes the unadjusted tax extremely regressive. A monthly "prebate" check would be sent to all according to family size and designed to reimburse the tax that would be paid by a family spending up to the poverty level (no matter how much money the family had in the bank). Sending monthly checks to wealthy families does not sit well with those who believe government discretionary spending can, and should be, targeted based on need. Unlike the Fair Tax, the 2-4-8 Tax Blend provides the government with both income and family wealth data essential to fairly evaluate need. The high sales tax rate of the Flat Tax is combined with state and local sales taxes in most jurisdictions, making the tax paid by the consumer closer to 40%. Since this tax applies only to new goods, individuals will be incentivized into purchasing used items (i.e. clothing, electronics, furniture, toys, etc.) and local garage sales (and their internet equivalent) will be more common. The unintended consequences include not only the "second hand Rose" incentive, but also significant economic loss to GDP by reducing the demand for new products. Lawful service providers will also have to compete with individuals willing to risk evasion of the law by offering to provide their services for a 50 percent cash discount. Others may seek to sell their services by expanding the role of nonprofits to provide a wider range of tax free services to the needy. The bottom line is known well by all true conservatives - high tax rates always cause big unintended problems. The BTT (Business Transfer Tax) is a tax on, "revenue from the sale of goods and services minus purchases of goods and services from other businesses." Capital costs such as machinery and equipment would be fully deductible and financial transactions (such as interest, dividends, and capital gains) are not considered in computing the taxable base. Revenue from exports is also excluded. The changes in computing business income and profit are so radical that a separate name, "BTT", has been given to this business levy. Like the Flat Taxes and the Sales Tax described above, the key feature is to remove investments and financial transactions from tax liability. The BTT provides investors and owners with a broader range of tax free compensation options. The tax favors automation (via immediate expensing of capital costs) over job creation (because wages are not deductable). For historical perspective, this tax was formally suggested in the 1995 USA Tax Act when unemployment rates were low and before the sharp declines in family wealth for 90 percent of the population. A BTT would be hard to consider seriously after the Great Recession. The Heritage Foundation discusses the VAT (value added tax) under the heading "Additional Tax Systems" and contends, "There is frequent talk by some that the U.S. needs to levy a credit-invoice value-added tax (VAT). In addition to not raising taxes, tax reform should not add new tax systems on top of the existing ones. Another tax system would increase complexity and likely allow the federal government to extract higher taxes from American taxpayers." There are a few VAT variations with the one originally embraced by Rep. Paul Ryan being a "subtraction method VAT". In general, it may be best to think generally of a VAT as a business income tax that attaches to gross sales of goods and services. Most VAT taxes permit a credit only for VAT taxes paid by other businesses in the chain of production and distribution (and delivery). Other deductions are not allowed and that is why every developed country in the world considers a VAT to be the fairest way to tax all different types of businesses across different taxing jurisdictions. The 2-4-8 Tax Blend uses a 4 percent VAT to offset the worst tax (job killing payroll taxes) with a fair business tax that has no adverse impact on jobs. Although the 4 percent rate would be the lowest in the world, there is arguably a legitimate concern that the very existence of VAT would "likely allow the federal government to extract higher taxes" in the future. Indeed, given the blend of wealth, income and VAT tax bases, a needed future increase in revenue might be politically easiest to generate by increasing the VAT rate. Even if total revenue were adequate, some might want to raise the VAT rate for the sole purpose of reducing the income and/or wealth tax rates. Alas, we are all at the mercy of the next Congress Tweaking tax rates is an option that future electorates must have. The 2-4-8 Tax Blend replaces the payroll taxes, the largest U.S. tax. For the sake of uniformity and federalism most federal levies and excise taxes in the nature of a sales tax should be eliminated, subject only to the 4 percent VAT. This is not to suggest that gasoline, cigarettes, alcohol and other products should not be taxed at a higher rate, but rather, to allow state and local governments to set their own rates and use the additional revenue as they deem best. It can be a distortion of local needs and priorities for the federal government to raise dedicated tax funds and attempt to redistribute the funds back to the states according to some formula that Congress considers best for roads, transit, health, education and other competing needs. Most other fee-for-service revenues would have to be examined to see if they are necessary to ration resources such as permits, entrance fees, transportation, health or other government functions or if they preferably might be eliminated and funded from general tax revenue. It is important to understand that a free product or service might distort behavior and the market just as much as one that is improperly priced. For example, in health care, free prescription drugs would not encourage patients to use more medication then prescribed, but free doctor visits could encourage a hypochondriac to indulge in unnecessary visits. States and localities would have the option of increasing VAT rates. For the purpose of interstate products, the delivery carrier is providing a distribution service so the VAT rate at the point of delivery could apply if it were higher than the place of sale. The normal interstate competition for business would discourage most states from imposing high rates. The lower 8% federal income tax rate for most taxpayers under the 2-4-8 Tax Blend suggests that states might choose to rely more heavily on income taxes even if state income and property taxes were not deductable on federal returns. States could also elect a more progressive tax (varying by wealth and income) rather than just a flat rate income tax to accommodate the needs of the poor. The 2-4-8 Tax Blend has no adjustment for family relations and wealth tax exemptions are per person. There is no marriage penalty. All essential tax credits and expenditures for children and the disabled are replaced by spending programs that can be adjusted based on need. The earned income tax credit would be replaced by the elimination of payroll taxes, the transitional jobs program and consolidated support services geared to individual and family needs. Employer provided health insurance policies has been tax exempt for 75 years. Employers often spend a great deal more money on family policies than policies for unmarried workers with no children. The ACA left this provision intact. Changes to national tax policy should ideally be coordinated with future health care reforms. Any requirement that individuals maintain health insurance or obtain insurance for members of their family is effectively a tax in the form of a regulation - at least to the extent of any tax penalty involved. A conservative and ethical approach would likely prohibit volume discounts in health care. Discounts for some necessarily raise costs for those not eligible for the discount(s) and violate non-discrimination policy objectives. Changes could lead to a system where employees simply purchase their own insurance. The low 8 percent income tax on additional wages intended to cover health care minimizes any tax burden that would come from removing the employee health insurance exemption. Low wealth and low income families unable to purchase insurance should be able to obtain help from the spending side of the budget and/or at the local level rather than through the tax code. The tax code offers many different provisions to avoid or reduce taxes related to education, health care, home ownership and retirement expenses. The 2-4-8 Tax Blend proposes a consolidation of all tax favored activities into one flexible savings account that serves all tax favored purposes and defines when withdrawals can be made without penalty. Under the 2-4-8 Tax Blend, the amount of the account would be limited to $500,000 per person according to the principle that unnecessary tax expenditures are wasteful. The limitation also coincides with and reinforces the typical needs of middle class families over the course of a successful work life. The $500,000 per person limit is well above average but is not so high as to wastefully reduce government tax revenue needed for all other vital services. Moreover, esteemed economists such as Ben Bernanke and Larry Summers agree that current circumstances have led to a global savings glut at the investor level. A territorial tax system that only taxes income that businesses earn within the U.S. (as distinct from the current worldwide system) is not necessary and may be counterproductive. In the age of global communication, it is sometimes quite difficult to identify a point of sale or to clearly define earnings within or from a specific political jurisdiction. With a worldwide tax system, U.S. tax liability remains the same for most taxpayers, subject to offsets for foreign taxes paid. A territorial tax system encourages the shifting of earnings and jobs to locations with the lowest tax rate and incites competition among various jurisdictions. The U.S. system of tax deferral could effectively reduce foreign corporate tax liability to zero by lowering the C corporation rate to 8 percent - below that of most countries. Tax haven countries with no corporate income tax may become less attractive to many businesses. Of course, stockholders in the U.S. parent of the foreign subsidiary will pay an increase in wealth tax to the extent the foreign profits are reflected in the higher stock price of the parent company. The Heritage Foundation goes so far as to suggest that the U.S. should "also stop taxing individual Americans on their income earned abroad." Such a change could encourage individuals (in addition to corporations) to shift assets out of the U.S. to avoid taxes on all manner of savings, investments and business activities. The 2-4-8 Tax Blend retains worldwide jurisdiction. The 8% U.S. income tax would be generally avoided due to offsets for foreign taxes paid. The 2 percent wealth tax would, however, attach to all foreign assets owned by U.S. taxpayers. A broader range of foreign tax deductions might be allowed such that foreign property taxes would offset U.S. wealth taxes owed on the value of the same real property. For the sake of computing net wealth, only U.S. debts considered as taxable assets to U.S. lenders would generally be considered as offsets. Foreign loans and debts might be permitted as offsets to the extent of the value of non-financial foreign assets. The wealth tax can be avoided by paying a 26 percent income tax rate. Very wealthy taxpayers can be expected to choose this rate. For example, this is particularly true for investors such as Warren Buffett who may have annual economic income in the billions (i.e. from stock appreciation) but taxable income in the range of $50 million or less. The new election of a 26% tax rate enables the continuation of significant tax free (or at least tax deferred) growth in wealth. It also allows charitable contributions with the full benefit of the appreciated value of any stock or similar assets. The new transitional jobs program also helps to offset or minimize any job losses from the transfer of funds (via donation) from the business sector to the charitable sector. The larger issue underlying the efforts to accommodate global corporations and wealthy individuals may have less to do with political clout or crony capitalism and more to do with international competition. Businesses may operate in almost any country and in multiple countries at the same time. A business may also seek to be a corporate citizen of one country with subsidiaries in others. More importantly, corporations and individuals may change like chameleons, shifting taxable and exempt assets with considerable speed. The 2-4-8 Tax Blend embraces "double taxation" and broad tax bases to achieve the lowest rates possible. Low rates are the best way to avoid domestic and foreign pressure to enact counterproductive tax expenditures, and minimize the clever efforts of competing foreign governments to create tax havens or cater to specific industries. Most importantly, the 26 percent election enables billionaire investors to pay a fair income tax rate while delaying taxes on appreciated assets until after death (assuming no need to sell most of their appreciated assets). Investors at this level can always avoid most taxes by operating through corporations, including foreign corporations, that may owe little or no U.S. taxes and pay no dividends subject to income tax. Investors may lawfully focus on increasing the share value of their companies tax free (or at least tax differed). This method of business helps to make many U.S. billionaires immune to most pressure from foreign tax havens - (an issue which is extremely important to the continued operation of large conglomerates, global corporations and international tax policy). Foreign individuals and companies own shares of U.S. companies but they may not be subject to U.S. taxes on all their income and wealth. For tax purposes, they might simply be treated as individuals subject to the 8 percent income rate and 2 percent wealth tax on the shares with their tax liability easy computed and withheld by the business. The 26 percent income tax rate election should be reserved for U.S. taxpayers subject to worldwide jurisdiction. Most non-charitable family trusts would also be taxed like individuals electing to pay 2 percent on net wealth and 8 percent on income. U.S. individual taxpayers who were beneficiaries under the trust would pay their share of trust income and wealth only to the extent U.S. taxes were not paid by the trust (as could be the case with a foreign trust). Taxpayers electing the 26 percent income tax rate would be subject to a gift tax upon setting up a non-charitable trust. Those taxpayers electing to pay wealth taxes may transfer to a U.S. trust or other U.S. taxpayer, tax free. A taxpayer switching from the 26 percent election would also be subject to an additional penalty computed as if he or she died and inherited all the assets. The primary equity is that those paying the wealth tax avoid estate taxes but pay wealth taxes year after year. Those paying 26 percent avoid the wealth tax but implicitly agree to either give their assets to charity or subject their heirs to an estate tax that recoups taxes on the appreciated value of assets. The Heritage Foundation argues that government benefits like Social Security should be taxable or otherwise included "on the Treasury Department and the Joint Committee on Taxation ... tax expenditures lists". This change would be fine provided the benefit rate were raised by 8 percent and this was withheld for taxes; leaving the after tax payment identical for most taxpayers (and the taxes prepaid). Of course, those electing to pay the 26 percent income tax rate would see an 18 percent reduction in their benefits and there is no reason to disagree with Heritage on this issue. Similar government benefits could be increased and taxes withheld in the same way. Governments at all levels consume about one-third of the economy according to the Heritage Foundation which further suggests that a "sales tax or BTT needs to impose a separate tax on government purchases to ensure neutrality." The argument must be compared with the Heritage comments about opposing a VAT tax because, "another tax system would increase complexity." It seems like the BTT would be another tax system so standing alone the no new tax system is not a valid argument against a VAT. More importantly, a VAT is a tax on businesses passed to all consumers - including federal, state and local governments. A VAT is exactly the kind of tax Heritage should be looking for in order to avoid, "an incentive to consume through government rather than privately". The 2-4-8 Tax Blend creates an adaptive tax code that accommodates changing family needs over a typical work life. By setting middle class needs as government goals policy makers can provide more help to more people to reach a modest level of economic success. Targeting government funds requires that recourses are not wasted on individuals and businesses that don't require help. Children from low wealth families need support and the wealth tax provides the data needed to help determine how much support should be given and when. Making fair decisions about need based only on income of the custodial parent(s), and without regard to net wealth, is both wasteful and inequitable. Some "middle class" families earning two or three times the "income" poverty level with large debts and few assets can be just as needy as lower income families with adequate savings. Society must stop pretending that income is the only measure of poverty (or even a good measure of need), particularly when part time employment (and the reduced earnings it implies) is a matter of choice and convenience for many. An integral transitional jobs policy can fully eliminate unemployment and the needless suffering it causes to millions of families. Real full employment for U.S. citizens also leads to the inevitable breakdown of any significant opposition to comprehensive immigration reform. This should be viewed as a welcome byproduct rather than an unintended consequence of a transitional jobs program integrated with the tax code and modified charitable tax deduction. A broad and diversified tax base produces the lowest rates that cannot be matched if some types of income or certain tax bases are excluded. The 2-4-8 Tax Blend creates a formula for sustained economic and tax revenue growth that is less affected by the foreseeable tides of our economic ocean. Further health care reforms are inevitable and stable funding combined with better data can lead to better policy designs. It is possible to minimize the discriminatory aspects of health care and still reward excellence and flexibility in health care. For example, in a system where states have more control over health insurance and nonprofit care providers and hospitals, it would still be possible for the federal government to fully fund prescription medication. The top policy priority being that cost should not impair essential drug treatment for anyone. Government regulation of medication, rather than production costs, is the main factor in the high cost of innovation. The government should reap the benefit of lower costs to encourage better regulation of drug development and better prescription treatments. The long range potential for the government to actually fund and manage any new aspect of health care, including one intended to save private dollars through efficiency, will depend a great deal upon better management of the federal budget and ultimately on sound tax reform. It remains an awful mistake to think that complex systems, like health care. can be run through the tax code and the IRS. It is also worth considering that an elimination of the tax exemption for employer funded health care might provide sufficient revenue (about $250 billion) to pay for a free prescription drug program that would help all citizens whether or not they had a job. See Dubay, Curtis S. and Burton, David R., "A Tax Reform Primer for the 2016 Presidential Candidates", The Heritage Foundation, April 7, 2015. Available at http://www.heritage.org/research/reports/2015/04/a-tax-reform-primer-for-the-2016-presidential-candidates. Hereinafter referred to as "Tax Reform Primer". Several years ago Rep. Paul Ryan, now Chairman of the House Ways and Means Committee, recommended an 8.5 percent subtraction method VAT as a full replacement for the C corporation tax. See http://www.freedomworks.org/content/ryans-roadmap-resources. The 2-4-8 Tax Blend is less radical, using a VAT about half the size, and reducing revenue from the C corporation income tax by about half. Some revenue is also reallocated to achieve a payroll tax replacement. A VAT is used by every developed country in the world and is considered the fairest way to tax different types of businesses across different taxing jurisdictions. Even with worldwide tax jurisdiction, the low corporate income tax rate would eliminate the problem of deferral of foreign subsidiary profits. In most cases, foreign income taxes would exceed 8 percent and no taxes would be owed upon repatriation of the profits to the U.S. parent. Profits accumulating in tax haven countries with little or no income tax (if still considered a useful tax avoidance) would only be subject to an 8 percent income tax. which has been shown to be manageable by U.S. global businesses. The Flat Tax Act bill does not currently provide for payroll tax replacement. Nevertheless, Dubay and Burton writing for the Heritage Foundation note, "Under both the traditional and new flat taxes, the existing payroll tax would be redundant because it is essentially a flat tax, too; it can be rolled into either flat tax." This suggests strong conservative support for payroll tax replacement. See "Tax Reform Primer", page 7. Bill Gates spoke about payroll tax replacement at the American Enterprise Institute on March 13, 2014. He expressed the belief that this would help workers more than the proposal to increase the federal minimum wage. Casey B. Mulligan: How Payroll Tax Cuts Can Create Jobs - NYTimes.com, September 14, 2011. Current compliance costs are estimated to be between $125 billion and $400 billion. "Tax Reform Primer", page 3. The word "tax" actually comes from the Latin word "taxitio" which means, "valuing, appraisal, estimation". See http://www.perseus.tufts.edu/hopper/morph?l=taxatio&la=la&can=taxatio0&prior=taxa. Items insured, such as vehicles, buildings, house contents, jewelry and artwork, would be valued by the insurance company and casualty claims. Tort litigation recovery would be limited to the amounts declared on the tax return (subject to customary replacement value adjustments). Investors know that growth must exceed the rate of inflation to be real growth. Nevertheless, any growth can create a positive impact when compared to a loss. Senators Rubio and Lee have encouraged an expansion of child care credits for higher earners. "Tax Reform Primer" page 6. The word, "allows," is accurate but it must be understood that workers often have nothing to invest apart from pre-tax income. Investors really hope to invest tax exempt income and to never have to pay taxes on any further investment returns. The efforts to avoid taxes knows no bounds. The 28 percent rate would generate about 18.5 percent of GDP. See http://www.heritage.org/research/factsheets/2012/01/the-new-flat-tax-encourages-growth-and-job-creation. "Tax Reform Primer" page 8. The 26 percent tax rate along with the "elective" use of the 2 percent wealth tax was a major revision of the 2-4-8 Tax Blend in 2013. The change reflected some reasonable acceptance of large accumulations of wealth at the top particularly where business investment was being maximized. This change also enabled the charitable contribution to be retained in order to implement a transitional jobs program. A broader chronology of U.S. wealth tax proposals is contained at http://www.taxnetwealth.com/06_Wealth_Tax_Pioneers.aspx. A comparison might be made with the newest credit cards that offer one percent cash back when the purchase is made and another one percent back when payment is made. The bank reinforces both functions of an ideal customer and the customer is rewarded twice as often. In the 2-4-8 tax blend the low income tax rate reinforces labor and the exemptions encourage targeted savings. The wealth tax becomes a significant burden only after substantial middle class status has been attained. "Tax Reform Primer" page 9. An April 13, 2015 op-ed in the New York Times by Professors Laura Tach and Kathryn Din titled, "When Taxes Aren't a Drag," noted that a single parent with two children earning $19,790 a year is entitled to "a tax refund check of more than $5,000 from the earned income tax credit, plus the child tax credit, worth up to $2,000 for her family of three." See http://www.nytimes.com/2015/04/13/opinion/when-taxes-arent-a-drag.html. Are the $7,000 tax credits a reward for working only two days a week, an incentive to the employer to keep wages on the low side and/or the best available way to help workers reach the middle class? The federal government fully funds the care of end stage renal disease for all. The suggestion to fully fund prescription medications for all disease has some similar policy considerations and advantages. The exemption is said to be, "a stealth subsidy that is both unfair and inefficient." See "End the Exemption for Employer Provided Health Care" by Joseph Antos, Wilson H. Taylor scholar in health care and retirement policy at the American Enterprise Institute, April 14, 2015. Mr. Antos argues that, "lost revenue is more than enough to cover the cost of providing health insurance to the 42 million people who were uninsured in 2013," but the health care solution should not depend on shifting costs from middle class workers to low wage workers and the unemployed. A free drug plan reduces the cost of health care and offsets increases in tax liability. See http://www.nytimes.com/roomfordebate/2015/04/14/the-worst-tax-breaks/end-the-exemption-for-employer-provided-health-care.